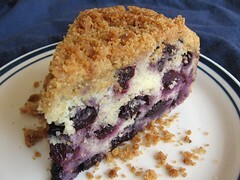 Blueberry Buckle - Do You Know The Muffin Man? Notes: I bought $20 of cultivated blueberries at the market on Friday and have been trying recipes to use them up. This cake got good reviews online and wasn't too hard to make. There's no additional liquid like milk in it, all the moisture is from the blueberries. The crunchy streusel is a nice topping, but gets soft after a day or so. Would taste even better with wild berries. I baked this in an 8" pan, so it was nice and thick, taking about 15 minutes longer in the oven.